Folk dancing is a broad term used to describe a wide array of dances. Every culture around the world has its own folk dances, and there are usually specific ones for big celebrations like weddings. The term "folk dance" is simply defined as a dance that has a particular set of steps or figures that repeat in time to music. There are also usually partners in folk dancing, where everyone from one couple to many couples can dance at one time. While folk dancing varies throughout the world, there are a few fundamental steps that can be found in almost every dance and style. Many steps are ones you have likely seen before, while others may seem unique and challenging upon first attempt. Perhaps one of the most basic and energetic moves of folk dance, hopping steps are often used in choreography. Some cultures incorporate an alternating hop, placing the weight on one foot and then the other. Others involve repetitive hopping, either in place or as a traveling movement. Hopping is also used to bring skill and pageantry to other steps that can also be done without leaving the ground. 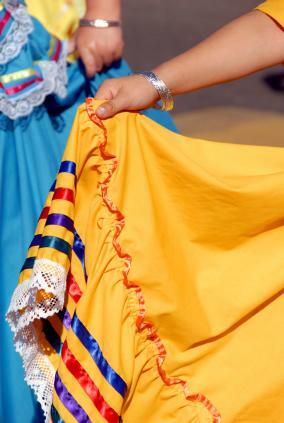 Chassés are found in ballet and jazz dance, and are also often used in folk dance. Considered to be a traveling step, these are graceful side steps that get the dancer to a new position in the room. You can also chassé in a circle; often it starts with the dancer stepping to the right, and then immediately bringing the left foot in to meet the right. Knees are bent with the right step, and a small leap naturally occurs when the left foot is brought in. While in this "leap," the right foot is brought out again. This movement repeats as the dancer travels across the floor. Of course, this step can also start with the left foot to reverse direction. Chassés are especially illustrious when there are many dancers on the floor at once. With some cultures incorporating vividly colored costuming, it becomes a graceful showcase of movement and celebration. The Schottishe can be used as a traveling step, or in a circle. It is usually used in celebratory folk dances, or in routines involving children. In the United States and Europe, English folk dancing is a popular form. It also has some very novice dance steps that can be learned simply by reading short written descriptions. Allemande Right - One arm is bent upward and partners' hands are pressed together. Partners then walk in a circle, making a full rotation and ending in their original spots. Basket - Involving up to eight dancers, men place their arms around the women's backs, while the ladies rest their hands on the men's shoulders. Connected, they pivot clockwise so they resemble a rotating basket shape. Cross Over - Walk past your partner's right shoulder, so you "cross" them, and then rotate and repeat to face each other again. These are just a few of many basic folk dancing steps that are fun and easy to learn. If you are interested in learning folk dance, check out your local recreation center or dance studio. If you have a particular ethnic background that has roots in folk dance, a cultural center or group in your area may help you learn dances specific to your heritage.